My enthusiasm for the amp was dampened slightly but became a white-hot flame of interest once I began to work with the unusual Damping Factor feature. I can put up with the quirks largely because of two things, the uncanny ability of Italians to get the Midrange perfect, and the “best of both worlds” experience the PA-1175 offers through use of the DF switch. In the current amplifier market Gold Note may have the coolest feature available in the Damping Factor. This is no gimmick or marketing ploy, but a serious uncommon advantage conferred upon the owner. Anyone who has spent time with solid state versus tube amplifiers knows the variance in sound can be dramatic. 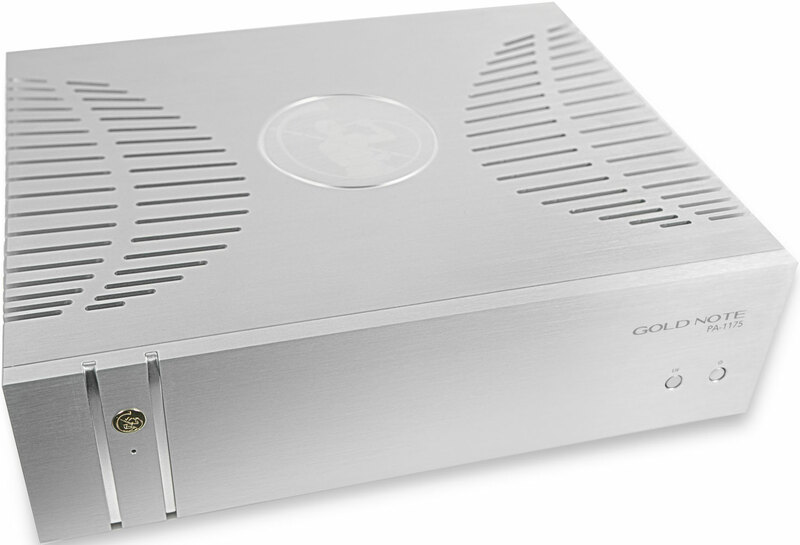 Speakers react substantially differently when hooked up to a solid-state amp with high power versus a tube amp with lower power. For our objectivist friends reading this, I have no desire to debate my perspective with you. Why am I discussing power when the Damping Factor is all about controlling the excursion of the drivers? For the simple reason that the DF feature alters the sound in such a way that one senses they have switched out the amp from a higher power SS design to a lower power tube design. That is how much the DF control changes the listening event. I have placed enough heavy monoblock class A or A/B amps with my speakers, and also enough heavy tube amps with those same speakers. to know the effect immediately. The DF operates in a fashion that gets similar adjustments to the sound as if had I physically moved two separate amps in and out of the system. As an aside, on this topic we see the proclamations of specifications-driven audiophiles shown to be wrong by the reality of performance. I have seen dismissals of Damping Factor as irrelevant to amplifier operation, or at a minimum much less important than current delivery or wattage. It takes about ten seconds hearing the distinction to know that Damping Factor has a major effect upon a speaker, and while it is not typically treated as seriously by the hobbyist as those other design considerations, it should be. Once I heard the effect of switchable DF, I began paying very careful attention to that specification. Gold note recommends “…use of the low DF (25) setting with high sensitivity speakers and mini-monitors as the amount of energy used to reproduce the lower range of frequencies usually suits these kind of speakers best… Bigger or mid/low sensitivity speakers perform better when driven by a higher power amp with a higher DF.” While I agree in general with that guidance, there are a couple of things to consider, one being the overall quality of the speaker. Some speakers are not terribly precise, regardless of the advertising that claims otherwise. I would tend to run such speakers with the higher DF in order to tighten them up, and I would turn to cabling to tune them in terms of tonality. Conversely, a speaker with such beautiful expression as the just reviewed VanL Speakerworks Silhouette is a treat to hear with either of the DF settings. The Silhouette is a purist’s speaker, a refreshing departure from the crass offerings without the signs of a master craftsman’s touch. It is a minimalist speaker design, as is evidenced in the supreme quality of the 6/5” wooden cone dual motor mid/bass driver and minimal crossover, and as such lets the alternative settings of the PA-1175 be expressed readily with deftness. The Silhouette is not designed to be bone crunching, but soul caressing. See my article for a thorough introduction to this rare gem. The other consideration is that there is no telling what the preference of the listener will be. Some people enjoy a fuller, less tight low end. Some people prefer a sharper, laser guided upper end. Others insist on a predominant midrange that draws attention away from both the upper and lower end, even to the point of suggesting anything lower than 40 Hz is unnecessary for acceptable recreation of the event. For that reason it is worth trying the DF setting in both positions regardless of the speakers you are running. As the PA-1175 is robust, and the power structure is not affected by it, you should not enter into a situation where a speaker will be underpowered by going to the low DF setting. 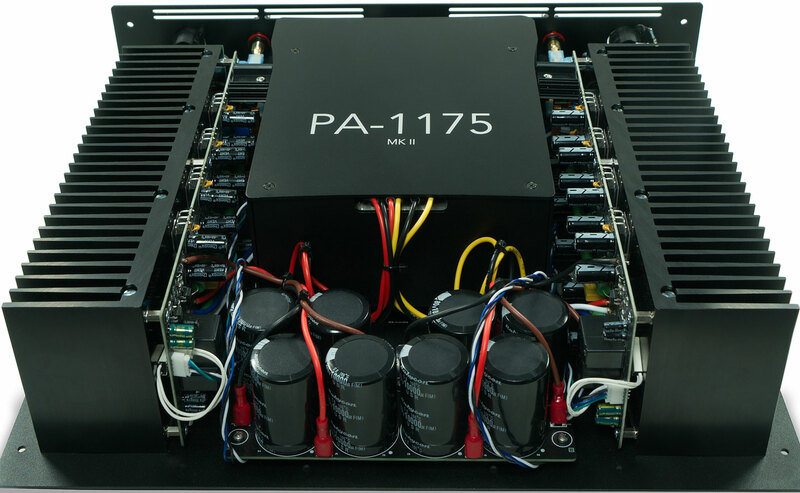 The PA-1175 is capable of powerful and drum-tight sound, with a “tell it like it is” sense of directness. The other PA-1175 is an exercise in restraint, loosening up to show a more relaxed side. The first description is the amp in high Damping Factor, and the second is the amp in low Damping Factor. I enjoy using what might be considered difficult recordings to test the limits of a component or speaker’s ability to handle them. A nice, pretty recording only tells me so much. Most products can seem lovely when fed a lovely recording. The more difficult recordings tell me as much about a product as the pretty recordings. Considering vocals that seem harsher, thinner, ­ oh, let’s just say it – irritating, how does the high versus low DF compare? I very much enjoy the artists to follow, but a great deal of that enjoyment is tied to obtaining softness, subtleness in the playback. As an example I must have heard Alison Krauss’s “Gravity” hundreds of times on dozens of rigs. Hers is a voice that to my ears is one Hertz below annoying. I have to establish a very refined rig to enable me to tolerate her singing at normal listening levels. Small Green Computer sonicTransporter AP i7 4T paired with the SONORE Signature Rendu SE; Clarity Cable Supernatural USB; COS D1 DAC + Preamplifier; ANTICABLES Level 4.1 Reference PLUS Xshadow XLR Balanced Interconnects with Schroeder Method interconnect placement utilizing specialty Y cables from Audio Sensibility; Gold Note PA-1175 amplifiers in Bridged Tied Load; and alternatively the VanL Speakerworks Silhouette Speaker or the PureAudioProject Trio15 Horn 1 Speaker. Power cables were ANTICABLES Level 3 Reference Series Power Cords. The ANTICABLES products are under review. The effect of the Damping Factor is enhanced by use of the amp in Bridge Tied Load mode. The nuances that distinguish the two DF settings are easy to detect with the additional power. On the higher DF setting Alison’s singing leaned toward clinical, as though she couldn’t bring herself to have any feeling for the town’s folk she left behind. Moving the switch to the lower DF, she sounded more reflective due to addition of midrange warmth. The Banjo accompaniment was less cutting. The bass, however lost some precision, but being a tad bit looser helped to offset her shrillness. Jason Mraz sings a live version of “The Boy’s Gone” and his voice as heard from system to system can go from banshee style to Alternative crooning. Neither is particularly enchanting, but I go to this piece as a measure of whether his stuttering at 2:40 into the song, “de-de-de-de-de- This is, Oh… de-de-de-de-de – This is, Yeah…,” comes off as rude repetition or playful adornment. If you like live music and have a tolerance for brightness in pursuit of detail, then likely the high DF setting will thrill you. It certainly does tend to ratchet up the intensity. To dial it back I changed to the low DF, and Mraz seemed more approachable. As well, alternating between high and low DF can be the salvation of many older recordings. Imagine having the convenience of a SS or tube amp without having to move either! There is ferocity, a wild strength, in Alison Moyet’s voice. This has calmed remarkably in later days, as she is now a Gold Note-worthy newcomer to Jazz standards and rock classics done with inimitable style. Her old rock ballad “Invisible” features her deeply recessed in the soundstage with the world’s loudest tambourine accompaniment, and an overall thin, Jukebox quality backing band. Yuck! I listen to this disaster for only one reason: her cannon of a voice. With high DF the treble is right in the face; prepare for her to sound like she is a block away and the tambourine player standing next to you. When the lower DF is in operation the tambourine player has at least moved closer to the speakers, in some vague approximation of being near her. Much needed balance, warmth and color results. It doesn’t save the recording entirely, but I can block out the irritating tambourine to hear her without wanting to take a hammer to the tambourine. Remember, we are comparing two aspects of the same amp, and yet this one feature can make you thankful over one or the other setting. The amp is not innately harsh, but I am speaking in relative terms. There are many amps through which I would not even play these tracks, as they are simply too tipped up, too unrefined to enjoy. These selections are difficult even for the super-smooth Belles ARIA Mono Block Amplifiers or the First Watt J2 amps. If these struggle to tame it, the piece of music borders on being unlistenable. It is a herculean feat for the PA-1175 to redeem these tracks.